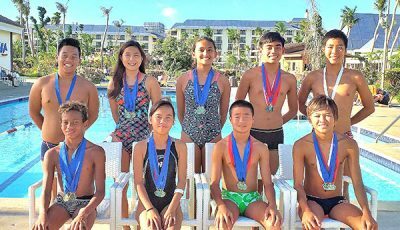 Saipan Swim Club’s Kento Akimaru was among the high-point winners in the SSC International Invitational Swim Meet held for three days at the Kan Pacific Swimming Pool. Saipan Swim Club’s Kento Akimaru competes in the 200m breaststroke event of the SSC International Invitational Swim Meet last Saturday at the Kan Pacific Swimming Pool. Akimaru lorded it over in the boys 13 to 14 age group, besting seven other swimmers. He collected 79 points off first place finishes in seven individual races (200 and 400m individual medley, 100m and 200m breaststroke, 50m butterfly, and 50m and 100m backstroke) and one relay (400m freestyle relay) and one runner-up (50m freestyle). Akimaru prevailed over teammate Christian Villacrusis (71 points), Tsunami Saipan’s Mark Maestro (54), Manhoben Swim Club’s Santiago Poppe (46), Andersen Marlins-PC’s Sekia Banes (38), and fellow SSC swimmers David Boyer (35), R.J. Pierce (18), and Dominic Zedde (11). Points were awarded based on each swimmer’s ranking in each race with 9 going to the winner. Sharing the 13 to 14 group top honors with Akimaru was Tsunami Guam’s Leilani Koiwa, who earned 77 points to edge teammate Samantha Hon (75). Madison Packbier completed Tsunami Guam’s Top 3 finish after gathering 56 points. 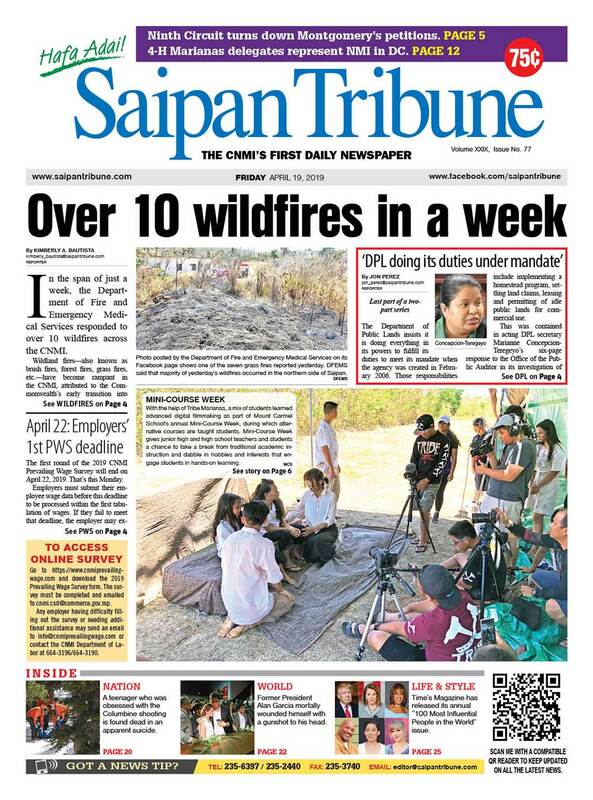 Rounding out the division were Manhoben’s Mineri Gomez (50), Palau’s Roylin Akiwo (46), Tsunami Guam’s Katelee McCormic (41) and Ayaka Lin (38), Tsunami Saipan’s Kyona Rivera (38), Andersen’s Jacobi Headlee (12), and Tsunami Saipan’s Kathrine Illani (4). Meanwhile, other top finishers in their respective age group are U8’s Ashley Dangol and Hans Xu of Tsunami Saipan; 9 to 10’s Esabelle Eldridge and Chuckie White of Tsunami Guam; 11 to 12’s Roxanne Mikel and Jimi Hendrix of Tsunami Guam; 15 to 16’s Rosalyn Mikel and Jagger Stephens of Tsunami Guam; and 17-and-over’s Dirngulbai Misech of Palau and Keigo Kitadate of Tsunami Guam. Dangol was the runaway winner in the girls U8 division after tallying 63 point. Her closest pursuer, teammate Maria Batallones, only bagged 24 points. SSC’s Andrei Kaith Lynn completed the podium finish after logging 23 points. Eight other swimmers joined the division. In the boys U18, Tsunami Saipan had a 1-2 finish with Isaiah Aleksenko placing second to Xu, who collected 83 points against the former’s 53. Manhoben’s Israel Poppe finished third with his 41 points, beating six other swimmers. In the girls 9 to 10, Eldridge won against 12 others after recording 81 points. SSC’s Coume Kaga came in at second with her 65 markers, while Tsunami Saipan’s Natsuki Naga had 39 to rank third. In the 15-swimmer boys division, there was a close fight for first place, with White’s 66 points edging the 64 of SSC’s Jinnozuke Suzuki. Tsunami Saipan’s Anthony Camacho-Deleon Guerrero finished third with his 60 points. In the girls 11 to 12, Roxanne posted 72 points to beat Tsunami Saipan’s Sophia Gauran (65) and Aika Watanabe (46). Thirteen other swimmers entered the division. In the boys category, Hendrix was way ahead with his 81 points versus the 66 of teammate Ken Hasegawa. Palau’s Noel Keane rounded out the Top 3 after gaining 60 markers. Roxanne’s older sister, Rosalyn, had a tough win in the girls 15 to 16 division against Tsunami Saipan’s Angel De Jesus, 66-64. Palau’s Rhema Joy Maido (56) and Berneace Balayo (51) and Manhoben’s Amanda Poppe (48) completed the division. 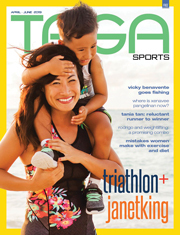 In the boys category, Jagger’s 72 points edged the 68 of Tsunami Saipan’s Takumi Sugie. Tsunami Guam’s Alexander Gonzalez made it to the Top 3 with his 52 points, just 2 more than fourth finisher and Tsunami Saipan’s Kaito Yanai. In the girls 17-and-over division, Palau finally got a high-point award with Misech downing the host’s Victoria Chentsova, 71-68. Tsunami Saipan’s Daime Rivera and Palau’s Romellen Maido, who tallied 63 and 55, respectively, were the other entries in the division. In the boys category, only two joined with Kitadate’s 81 besting the 39 of SSC’s Salofi Welch. 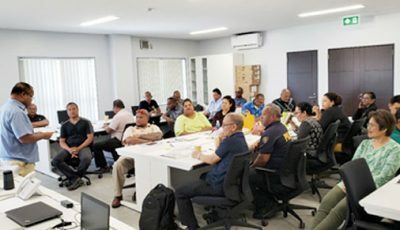 The SSC-hosted meet was held from Thursday to Saturday with over 100 swimmers from Saipan, Guam, Marshall Islands, and Palau competing in the three-day event. Yesterday’s ocean swim was cancelled due to typhoon Bavi. Results per races and the swimmers’ times will be reported later this week.